In the past, the rigor of a semester-end final exams fluctuated wildly at our school. This has a great deal to do with the District schedule, which does not allow teachers sufficient time to grade exams. As a result, final exams have either become multiple choice exams or less meaningful activities with little to no academic value. This year, our Ninth Grade Academy tried to be more consistent with our finals. My exam was weighted at 15% of a student’s overall grade. The District mandated that all World History students write to the same prompt: compare & contrast capitalism and socialism. Students were given some background knowledge on the evolution of capitalism and socialism in a handout featuring excerpts from Karl Marx, Frederich Engels, and Adam Smith. I provided a Zaption presentation to the whole class where students could answer questions that were embedded into a 14 minute Capitalism & Socialism Crash Course video number 33. Students were given digital devices and asked to answer questions. After the video, students retained the devices and played an online game of Kahoot, where they were asked to demonstrate their understanding of the differences between capitalism and socialism with 10 different scenarios. Students were also given compare/contrast sentence stems and one hour to answer the prompt. During the writing process, students were asked to underline claims and put parentheses (around any explanations, or evidence that supported the claims). The purpose of this final exam was to measure student effort. Following some great advice to have students write more and grade less. I charted word length, the number of claims, and the number of explanations and divided them into thirds, assigning each third a progressive amount of points, (i.e. 100, 95, 90, 89, 85, 80, 79, 75, 70). Grading was done class by class, but I have included all 164 of my ninth grade students below to help inform parents as to how their child is faring in regards to their peers. This assignment allowed me to give students a rigorous writing task, evaluate their efforts, and help students who had lost points by missing previous deadlines earn enough points to boost their grades. When we return to school after Winter Break, students will have the opportunity to engage in a process of peer review and revise their essays for additional points. A primary focus in my class this year has been teaching ninth graders to make deadlines and turn in their assignments on time. The main reason students fail my course is simply they do not turn work in on time, if at all. For example, our study of the Holocaust devoted 30 days to reading The Plot Against America. As a culminating task students created a character evolution timeline, which tracked one character through ten events in the story. The results were knowledgeable, creative and imaginative. Unfortunately, this assignment only had a 51% completion rate, which in turn had a negative impact on 49% of student grades. 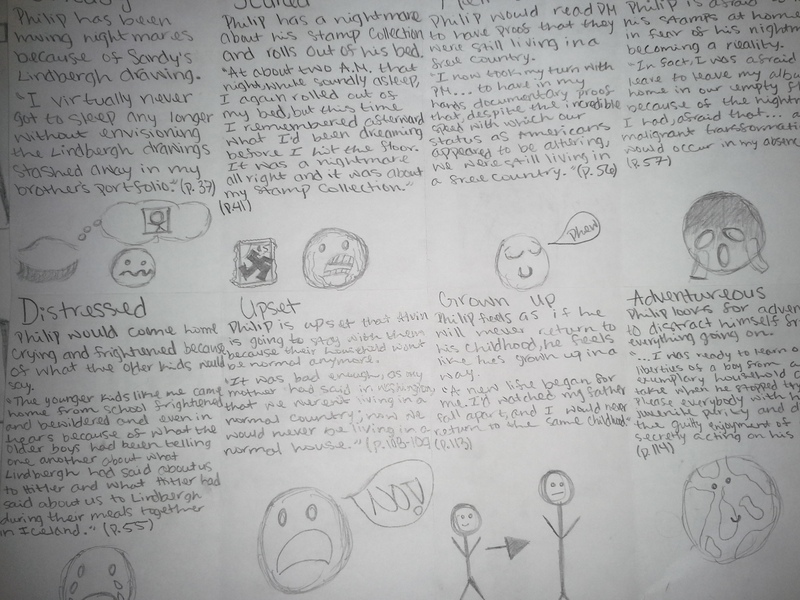 For their next assignments, students were required to view three survivor testimonies, annotate their notes, then turn each testimony into a poem, piece of art, or an essay that tells the survivor’s story forward. The majority of students did not address the contest’s prompt when creating their work. These projects were graded on student effort, students who read the contest rules and followed the directions were awarded 95 points, those who missed one element got 85 points and those who missed two or more elements got 75 points. Late work was awarded 60 points. Sixty percent of students turned in poems and received the following grades: 69 Fs (40% incompletion rate), 3 Ds, 24 Cs, 27 Bs, and 48 As. For poems, 89 students turned in video notes, which were worth 50 points and 81 students did not (48% incompletion rate). Sixty-five percent of students turned in Art entries and received 59 Fs (35% incompletion rate), 2 Ds, 34 Cs, 30 Bs, and 46 As. Only 88 students chose to turn in their video notes, 83 students (48% incompletion rate) did not turn in the required notes on a Holocaust survivor’s testimony. Lastly, fifty-eight percent of students turned in Essay entries: 72 Fs (42% incompletion rate), 3 Ds, 18 Cs, 31 Bs, and 46 As. Only 55 students turned in notes from the survivor’s video testimony, while 77 (58% incompletion rate) students did not. Considering the information above, it is not surprising that in the final grade distribution only 10% were As, 25% were Bs, 27% were Cs, 17% were Ds and 21% were Fs. What is surprising is how these grades cluster period by period. Most comprehensive high schools “track” students with Honors & AP programs. Thus, it is not surprising that the highest percentages of As and Bs occurred in Honors classes. What is particularly dispiriting in looking at the “regular” classes is that two of them contain majorities (66% & 51%) of students who are now ineligible for admission to a University of California. Further, research from the MRDC indicates that more than 40% of ninth grade students fail to promote to the tenth grade on time and fewer than 20% of those students recover from failure and graduate from high school. Ninth Grade Academies are designed to support the transition to high school by creating interdisciplinary teacher teams that have students and planning times in common. These teachers work to coordinate their courses to better meet their students’ needs. I wonder if my colleagues have similar work completion and course passage rates. How can our NGA better prepare students to complete their assignments and make deadlines instead of making excuses? My overall course passage rate was 79%, which means my course failure rate was 21%. Overall, this isn’t bad, however, my lowest achieving class periods have course failure rates of 62% and 60% respectively. I suspect that these students have been “tracked” and the culture they have developed of not caring about grades is greater than one teacher can overcome. Nevertheless, in the Spring semester, I will double my efforts to engage these students. In an earlier post, I described a character evolution timeline project that I assigned my students to measure their level of effort in spending more than 30 days reading The Plot Against America by Philip Roth. These projects were graded on effort and earned either 95, 85, or 75 points. Late work was given 59 points. This entry had nice art production values, but the author did not explain what the quotes meant. Excellent Work – Second Place Efforts. There is a substantial amount of text being analyzed on this entry. It looks like this author spent a fair amount of time thinking about the novel before beginning this project. This entry spent too much time coloring the art and not enough time explaining what the quotes meant. I like that the page numbers were cited. This author did more than ten events. This entry devoted a lot of space to the emoticons. I’d like to see more analysis of the text, but the layout and content make this a solid second-tier effort. This entry does not look like the author spent much time thinking about the book, or selecting quotes. There was no attempt to explain what the quotes meant. I understand that my students are taking five other classes and have homework and projects in each of them, however, these last two entries do not represent high school work. Out of 173 students, 31 got As (18%), 19 got Bs (11%), 37 got Cs (21%), and 85 students (49%) did not turn in timelines. Eight students received zeros for copying each other’s work. It is better to get a low grade for poor work than to lose all of the points for cheating. I expect more effort on your semester-end Holocaust projects. This year, Zaption has become my go-to tool as I check for understanding in my World History classes. I have learned (the hard way) that waiting for the end of unit DBQ to really “listen” to what students have learned in your class is setting yourself up for failure. After students have taken the test and written the essay, they have no motivation to go back and review the material no matter how wrong they were. So this year, I have embedded questions in my video lectures and shortened my writing assignments so that I can quickly assess student understanding and promptly correct any misunderstandings. When this gem appeared on my Edmodo discussion board, It was too late for me to help this student. They had not listened to any of my lectures and they had misunderstood what they read in the book. Their fundamental lack of WWII knowledge was at once horrifying and hilarious. 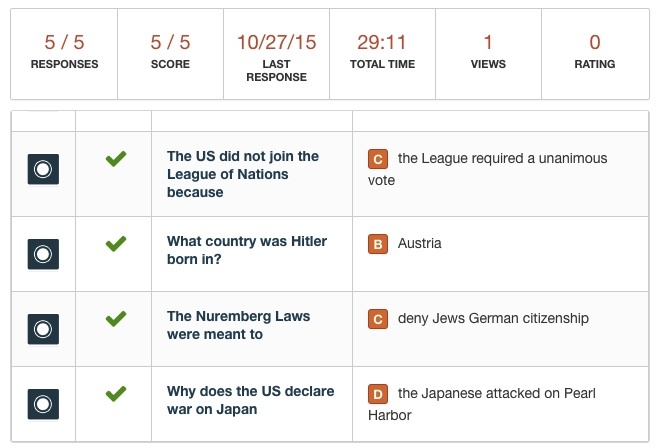 Zaption tours allow a teacher to ask students multiple-choice, true-false, open-ended, and/or discussion board-style questions during a video lecture. The answers to these questions provide teachers with insight as to student critical thinking skills and the level of effort they are putting into their study. In one video lecture, I explain that “Genocide” and “Holocaust” are not the same thing. “Holocaust” is a word of Greek origin meaning “sacrifice by fire.” Genocide was an element of the Holocaust, but the Holocaust was the systematic, bureaucratic, state-sponsored persecution and murder of approximately six million Jews by the Nazis. Thirty seconds later, I ask the students to explain these differences in an open-ended question. Holocaust is a word of Grecian origin, meaning “Sacrifice by Fire”. Genocide is the deliberate attempt to wipe out an entire ethnic, nationality, or religious group. This student does not understand. The difference between holocaust and genocide is holocaust is a word of the greek origin meaning sacrifice by fire and genocide is an element of the holocaust but yet the holocaust involved much more than genocide. This student’s careless use of the term “democratic movement” makes me red flag him for a private conversation during class the next day. A genocide is only a small part of the holocaust while the holocaust itself is a democratic movement by a racist opinion that the german’s are a superior race and that the jews are a weak and useless race. 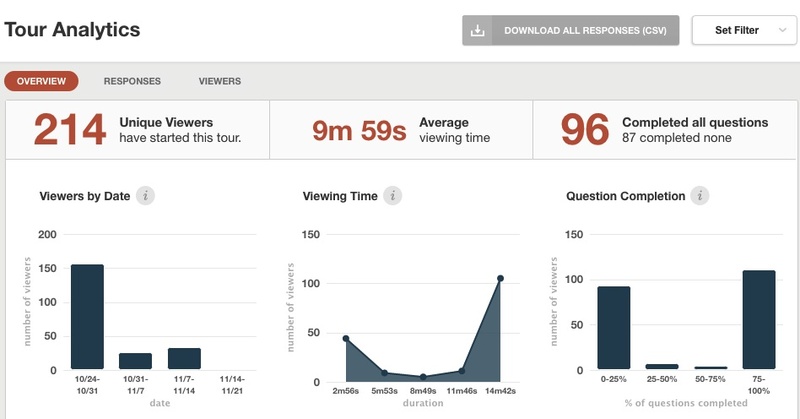 Zaption also provides a host of other analytics that are useful for determining who watched the videos, how long did they watch them, and how many questions did they get right. Right now the open-ended questions are my favorite. What have you learned from the data in your Zaption analytics? Please share your experiences and ideas in the comments section. 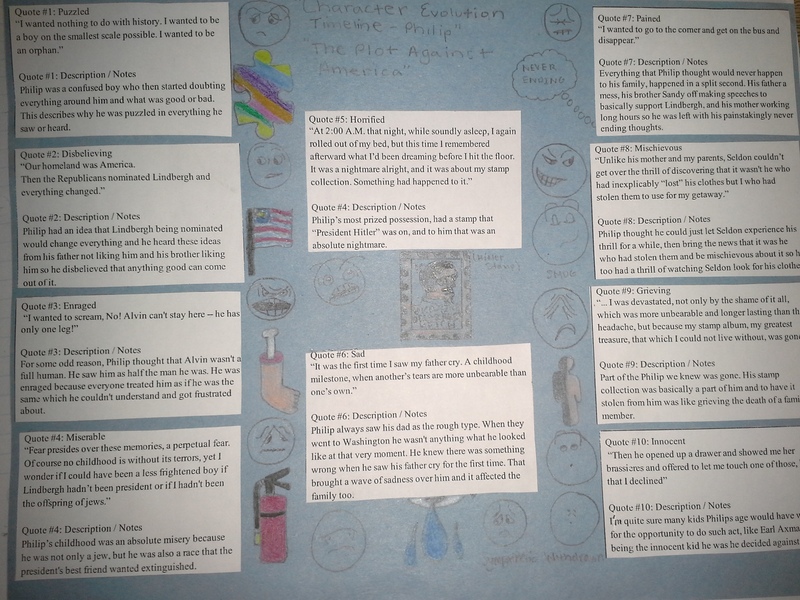 A character evolution timeline (see sample chapter on Narrative Writing & CCSS by Olson, Scarcella, & Matuchniak) requires a reader to follow one character through a story, select textual evidence to make a claim as to what a character is feeling, and then support that claim with evidence from the text. This activity gives students practice making inferences and identifying bias in a text. The 14 photos below are of different characters from The Plot Against America. 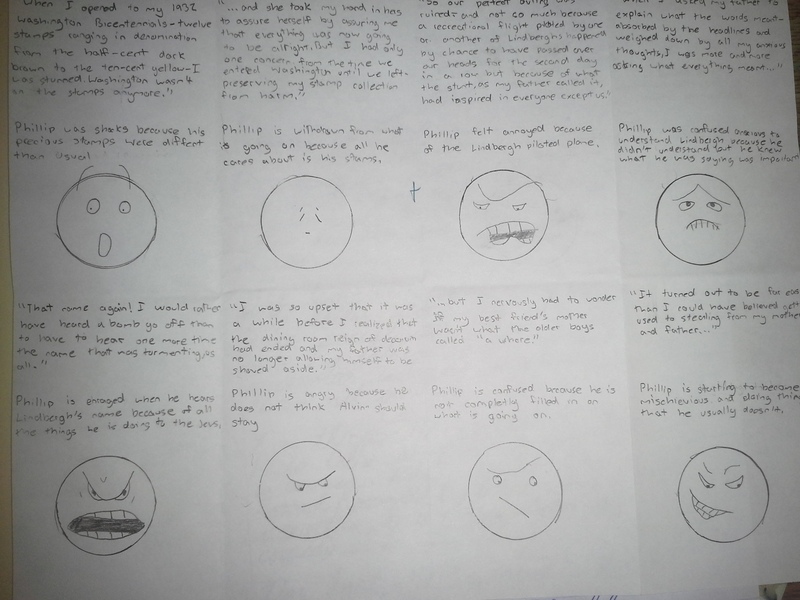 Students need to identify the character, use an emoticon or symbol to characterize the character’s emotional state and then explain the character’s feelings with a quote from the story. This activity is to help students develop skills in sourcing documents and making predictions as to a person’s motivation and an author’s intent.